I taught middle school science for twenty-seven years. It was often fun, but not always. Helping the kids make projects to demonstrate simple machines was a blast, but chemistry was no fun at all. It was a challenge to make astronomy appeal to my kids, but I think I managed. Teaching space had its ups and downs. The space race had everything, exploration, political intrigue, danger – both in space and in the Cold War which was the real reason for going to space – technology and a chance to participate. When I taught Gemini IV, I would put two chairs on their backs on a table and have two students lie back in them to represent McDivitt and White. Then I would take “Ed White” for a space walk. I was big and they were small. I would pick “Ed” up by the waist and take him spinning and “floating” around the classroom before he returned to the capsule. Great fun for both of us. I always chose the smallest student to play Ed White and, of course, always a boy. Sorry feminists, but if you think about it for a moment, you’ll see why. I could use the movies Apollo 13 and parts of The Right Stuff, and that was a big help. But the space race was teaching history. What was happening in the world outside the classroom during my teaching career was less fun. The Space Shuttles were practical. Five craft made 135 trips into space, expanded our knowledge, launched the Hubble, and built the ISS. They called the shuttle NASA’s pick-up truck. It was a good analogy, but what twelve year old wants to go to space in a pick-up truck? Nothing was really new, just more and better of the same old stuff. Nobody was going beyond low Earth orbit. There were promising new programs. I watched several of them as they were announced, begun, and then cancelled. I’ll recap them later. I taught the space shuttle with more enthusiasm than I actually felt. We followed its progress, and there was a lot of it during my teaching career. There was also tragedy. When the Challenger blew up, my class wasn’t watching. Our school got TV’s for the classrooms a couple of years later, so I didn’t know what had happened until recess when I went to the teacher’s lounge and saw faces suitable for a wake on my fellow teachers. It was a long afternoon, first explaining to the students what had occurred, and then going on with our work as if nothing had happened. I didn’t face another day like that until 9/11. 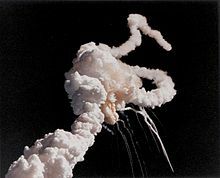 I remember sitting with my friends in the teacher’s lounge after Challenger blew up, listening to the radio. When the announcer said that the mission commander had flown fighter jets during Viet Nam, I knew that he had found a more honorable death than that war could have given him. When Columbia returned from orbit the last time, I was excited to see it. By that time I had moved to the foothills. Columbia’s flight path was to pass north of my new house, and I was up before daylight to watch its fire trail across the sky from my balcony. Instead, I only saw dense fog. I waited around until the projected time and at least heard it’s sonic boom. Five minutes later and a thousand miles to the east, it broke up and fell to earth. It was Saturday morning. I had two days before it would be time to talk to my students about what had happened. This entry was posted in A Writing Life and tagged memoir, spaceflight, teaching, writing on April 20, 2017 by sydlogsdon.